We dont have PFT's but she has good exercise tolerance. 1. surgery (is age alone an absolute contraindication, even if she would otherwise be a surgical candidate)? Looking for all opinions - use anonymous or make up a name if you wish, but all comments encouraged. 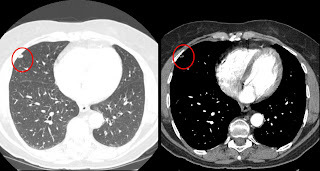 I recently saw a 62-year-old woman with a past medical history of fibromyalgia who received a CT scan for chest pain, which picked up an incidental pulmonary nodule. She is asymptomatic; no shortness of breath or cough. She is a 35 pack-year smoker and has not been able to quit. Her spirometry is normal. 3. Follow radiographically, say, with a repeat CT in 3 months? I'll tell you what I did after comments. Has anyone scoped his GI tract to R.O esophageal disease? 57 y.o. white female with SLE for 20+yrs presents with multiple small non calcified nodules on chest CT. CT was done for evaluation of asthma. Pt. symptomatic only with her usual migratory pleuritic pain associated with her lupus, and mild, intermittent asthmatic symptoms present since young adulthood. Asthma is treated prn with albuterol inhaler. Largest nodule is 6mm, most are peripheral and they are bilateral. Follow up chest CT scan 4 mos. later shows resolution of some of the nodules, the remaining ones show no growth. PFT are normal, O2 sat. normal. There has been no change in symptoms and no change in treatment for her lupus during that time. Other pertinent medical problems include allergic rhinitis, chronic sinusitis, S/P antral windows, and chronic bronchitis. Negative for pneumonia, SLE pneumonitis, RA, ANCA, anti-phospholipid AB. Recent echo WNL. No hx malignancy. Hx significant for living in Ohio River Valley prior to 1973 and Southern Calif. during 1990, but no history unusual respiratory infections. 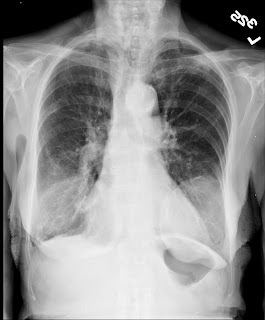 1998 chest xray normal. No xrays done until CT scan of chest and sinuses in 09/06. SLE confirmed without evidence of other connective tissue disease. Pt. on Placquenil 200mg BID and Methotrexate 22.5 mg/week. She did not pose a question but I assume it is what to do about the multiple nodules. Since the nodules decreased in size over 4 months, this is likely inflammatory and a repeat CT in 6 months for that last nodule would be what I would do. I'm not sure what her smoking history is, but pretest prob for malignancy is low here. Any one else wish to comment? Anonymous M.D. asks if anyone knows of alternative immunotherapy for the treatment of chronic hypersensitivity pneumonitis in a patient who is not responding to steroids. Her FVC has remained in the mid 50% range regardless of predxnisone does (range 0 to 40 mg). The HRCT shows fairly extensive ground glass to indicate an active alveolitis. Of note, this patient has an open lung bx that was consistent with the diagnosis of HP). I had posted a while ago on this patient with alveolar changes and a Bx consistent with PAP. We had also initiated a discussion on PAP and anti-GM-CSF antibodies. I did send the Pt's blood to the Cleveland Clinic and her titers were 1:12,800 (1:400 or less is the usual normal level). She is still asymptomatic and doing well. Have you checked anti-GM-CSF ABs in your PAP Pts? Would you start treatment at this point (she is asymptomatic with normal PFTs) or just monitor? One of my patients has had persistent post-thoracotomy pain following a RULobectomy in 9/05. She has been on gabapentin and narcotics; tried nerve root blocks (with short-lived results) and is not a drug-seeker. She has now undergone a dorsal rhizotomy (confirmed by path of the dorsal root ganglion) and after a 1-week improvement is now having even more pain. 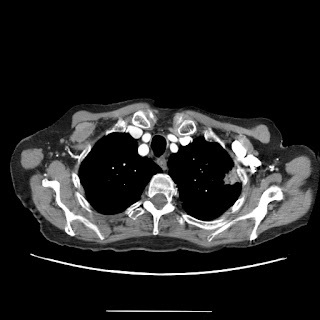 What do you usually do for these cases of persistent post-thoracotomy pain that extend for months and years?